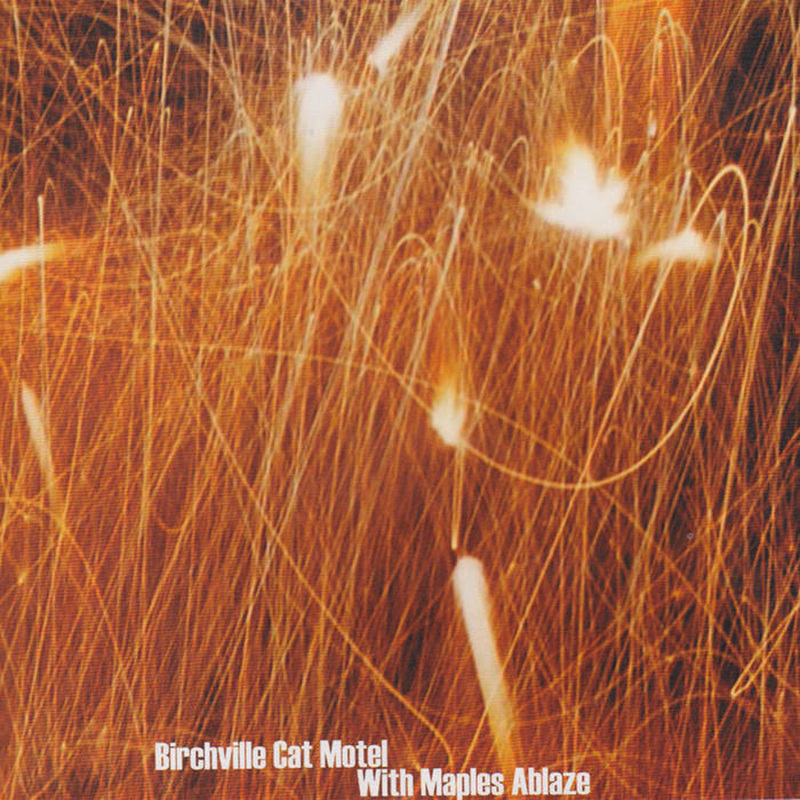 Brainwashed - Birchville Cat Motel, "With Maples Ablaze"
Birchville Cat Motel, "With Maples Ablaze"
For years, I have rightly hailed Campbell Kneale as one of the true dark wizards of gnarled guitar noise, but I did not fully appreciate the depth and breadth of his vision until only recently: pre-Bandcamp, it was quite a difficult, expensive, and overwhelming endeavor to keep up with his sprawling body of work. As a result, several landmark albums fell through the cracks and remain woefully underappreciated to this day. One such example is this 2004 release on the now-defunct Scarcelight label, a hallucinatory suite of musique concrète, deep drones, and innovative collage that drew in a murderers' row of talented collaborators like John Wiese, Bruce Russell, Jonathan Coleclough, Peter Wright, and Neil Campbell. As with many Kneale releases, With Maples Ablaze occasionally dips into some nerve-jangling and dissonant territory, but the high points are legitimately amazing to behold. Kneale’s singular vision for With Maples Ablaze is one that defies easy description, but the first two of the album's ten untitled pieces do as good a job at laying out its enigmatic parameters as anything that follows. After a slow fade-in that sounds like a gentle wind rustling through a meadow, the opening piece unexpectedly comes alive with brooding metallic drones and a sputtering eruption of hums and blurts that sounds like someone fighting with a patch cord that keeps shorting out. That cryptic and somewhat unpromising opening salvo then abruptly segues into the more compelling second piece, which marries a chorus of cheerily chirping birds with buzzing, heavy drones that converge into a throbbing and see-sawing pulse. Curiously, however, the field recordings stay in the foreground for most of the piece, only gradually and partially becoming consumed by hallucinatory flourishes of chimes and a queasily undulating haze of overtones. For the most part, the rest of the album continues in a similarly elusive vein, casting a fragile and dreamlike spell that slowly dissolves from collage into drone and back again. As befits an album with such an unusual and fluid structure, Kneale and his collaborators were similarly unconventional in their choice of instrumentation. Even the most overtly musical bits (the drones) feel like they are emanating from rubbed glass, groaning metal, or spectral harmonics rather than actual struck notes. At other times, the sounds on With Maples Ablaze sound far more like someone throttling a large balloon animal in the empty hull of a vast cargo ship. Consequently, it feels like absolute supernatural sorcery when the album's many strange textures and motifs cohere into something richly harmonic and sophisticated, which first happens on the album's epic fourth movement. It takes about five minutes to finally reveal its sublimely rapturous heart, of course, which is a rather masterful use of tension and deception. In any case, the vista that opens up is a truly gorgeous one, as Kneale combines a ghostly, vaporous haze of moaning melodies with a massive and shuddering edifice of shaking metal and warbling harmonics. It feels a lot like a haunted record player fading in and out of focus in a towering empty building that is shaking, swaying, and on the verge of collapse. In fact, it seems almost Biblical in its scope and beauty, like a non-hubristic Tower of Babel that is valiantly straining to reach the heavens despite the inexorable adversity of gravity. Of course, what Kneale was actually going for is anyone's guess, as the piece eventually transforms into a long, clattering field recording of a train pulling into the Hamburg station. Trying to find meaning in this album is probably a fool’s game, but Maples certainly whips up a wonderful illusion that there is something profoundly meaningful happening that remains maddeningly out of my grasp. Naturally, Kneale felt there needed to be a counterbalance to that achingly gorgeous centerpiece, so the album’s next major piece is a nightmarish, disorienting plunge into gibbering bedlam that sounds like a loop of backwards, pitch-shifted pop music. If I had an extremely bad reaction to a psychotropic drug while at a rave in the Smurfs' village, it would probably feel a hell of a lot like "With Maples Ablaze VI." From there, things stay very goddamn lysergic and unnerving for a while, as the eighth section feels like a field of infernal cows lazily mooing near a lake of bubbling lava. Unexpectedly, however, the album closes with lengthy final act of immersive, dreamlike reverie (albeit with some friendly chickens thrown into the mix, as well as some creeping menace). The twelve-minute "With Maples Ablaze IX" is the album's languorous and lush false ending of sorts, as gently oscillating and slow-moving drones drift like heavenly clouds over distant sounds of clattering metal, chirping birds, twinkling wind chimes, and happy barnyard animals. It is a wonderfully warm and lovely piece, but it gives way to a more uneasy and ambiguous coda, as the lingering chimes are slowly consumed by a crackling and bleary haze of ringing metal and smeared, uncomfortably harmonizing drones. It evokes quite a surreal and enigmatically haunting tableau, like a solitary figure is quietly setting the forest ablaze around a small village as a church organ mournfully drones and a blacksmith hammers away in the distance. The trajectory of With Maples Ablaze is not unlike sinking into an increasingly fractured and disturbing dream that opens up into an oasis of clarity once a crucial threshold has been reached...then having the slow realization that the oasis is actually a mirage. I was caught completely off-guard by how beautifully this album came together at the end, as there are definitely some lulls in the album where it feels like the narrative arc has been lost or derailed by indulgent bouts of abstraction. I suppose it is entirely possible that the thread was sometimes lost or that the album's trajectory gradually took shape organically, but it is far more significant that Kneale ultimately pulled the disparate threads together into something exquisitely satisfying. With Maples Ablaze is not quite a perfect album, but it is absolutely a unique one and some of the individual pieces are quite beautiful, brilliant, and deeply nuanced. Naturally, Kneale's many collaborators deserve some credit for the fascinating and ingenious directions that Maples takes, but he was the one that painstakingly assembled it into its complex and beguiling final form. Campbell Kneale took a leap into the unknown with this album and I have not heard anything else that resembles it before or since. Given the sheer volume of Kneale’s output, it is hopeless to guess where this release ranks in his vast discography, but I can confidently state that Maples is one of the more essential tips of an iceberg that I will be exploring for years.